McCarthy, Kennicott and Wrangell-St. Elias are undoubtedly one of the most unique, adventurous and diverse Alaska destinations. These two historic communities are right in the middle of America’s largest national park and surrounded by 13 million acres (5.25 m hectares) of wilderness just waiting to be explored. 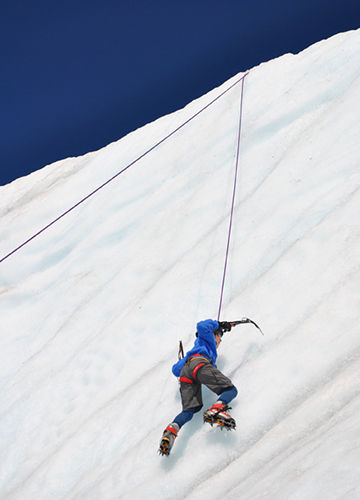 Take a short day hike to the glacier, go flightseeing, go on a guided glacier trek, pack raft a river or glacial lake, go on a zip line adventure, rent a mountain bike and tackle the trails, go whitewater rafting, fish pristine alpine lakes and more! The McCarthy and Kennicott area is steeped in colorful history, adventure and newfound friends for all who make the journey. Visitors claim once they’ve been here, they can’t wait to come back. 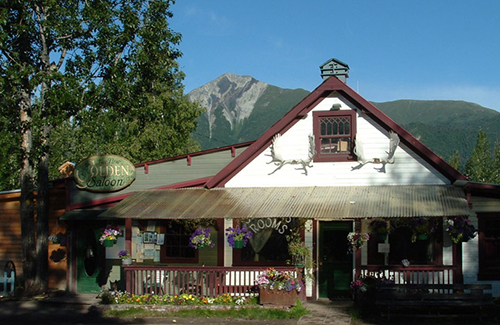 Enjoy swapping stories about backcountry trips at the Potato, making new friends and meeting the locals at the Golden Saloon, playing softball on Friday nights, and enjoying fine dining at McCarthy Lodge and Kennicott Glacier Lodge. And, each week during our long summer days there are special events to attend. 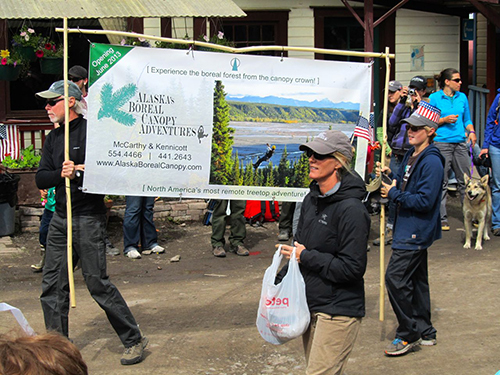 Natural history and historical presentations, films and arts events, many of which are conducted by the National Park Service or Wrangell Mountains Center, a McCarthy based environmental education institution. Our close-knit community helps create a rich learning experience for all in our spectacular wilderness setting. Don’t make the mistake of staying a short while, once you’re here you’ll see there’s much to see and do from your “basecamp” in Wrangell-St. Elias Park! Getting to McCarthy and Kennicott requires a little more time and effort. You’ll see, it’s well worth it! From Anchorage drive Route 1N Glenn Highway (National Scenic Byway) 3 hours (180 miles/290 km) to Glennallen. Turn right on Route 4 Richardson Highway (toward Valdez) for 40 mins (25 miles/40 km), then turn left (east) on Route 10 Edgerton Highway. 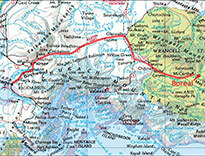 Chitina is about 35 miles/56 km further. From Chitina, follow the signs to McCarthy and cross the Copper River for a 2+ hour (60 mile/100 km) drive through spectacular scenery on the McCarthy Road. (A stop at Mile 113 Glenn Highway at Sheep Mountain Lodge is a nice break or overnight.) The numerous ponds and lakes along the McCarthy Road host migratory birds including Trumpeter Swans, Barrow’s Goldeneye and a number of ducks, widgeons and others. Have your binoculars and camera ready. Download the NPS McCarthy Road Guide and Bird Checklist. Another option is drive to Chitina and fly with Wrangell Mountain Air to McCarthy, they have daily scheduled flights. If you can travel on Mondays or Thursdays you can fly on the mail plane from Anchorage to McCarthy (with a brief stop at Glennallen/Gulkana) on Copper Valley Air and return on one of those days. 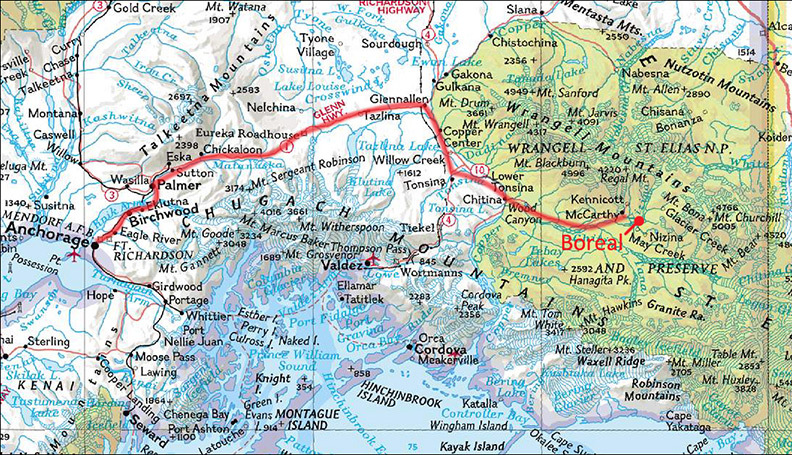 Wrangell Mountain Air also flies charters from Anchorage or other locations in Alaska. Just getting here is an adventure! As long as 8,000 to 10,000 years ago at the end of the last ice age, native Americans migrated across the land bridge between Asia and North America. As the glaciers receded, the first Americans fanned throughout Alaska. 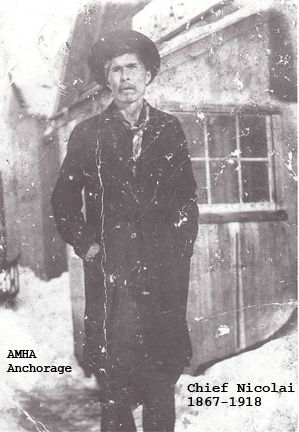 Those who found their home in the Copper River region were the Ahtna. They lived as one with the land and their lives followed the rhythm of the seasons. Beginning in 1867 when Alaska was purchased from the Russians, there was a keen interest by the U.S. Congress to explore the vast, newly acquired territory. However, it wasn’t until 1884 when the U.S. Army sent Lt. William R. Abercrombie on the Copper River Exploring Expedition with the mission to explore the Copper and Tanana River valleys. He made it as far as Abercrombie Rapids when travel became too slow and discouraging and was forced to turn back. 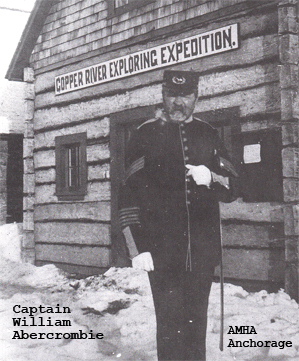 In 1885, Lt. Henry T. Allen with two enlisted men received the same assignment, to conduct a reconnaissance up the Copper and into the Tanana River. Having taken a month and a half to reach the Lower Ahtna traditional village of Taral, the expedition was suffering from snow blindness and exhaustion. 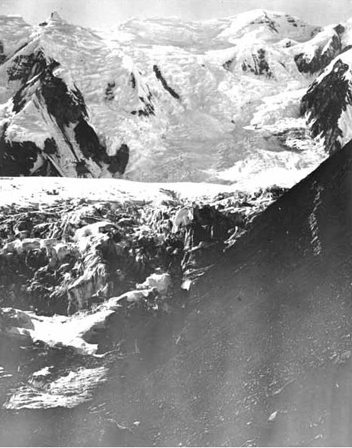 Since ice conditions impeded further travel upriver, Allen decided to explore the tributary Chitina. The Ahtna were known to have copper objects, presumably found in the Copper River tributaries. With the help of an Ahtna guide, Allen and his men made it to Chief Nicolai’s, the chief of the Lower Ahtna, encampment near the Nizina River at Dan Creek. This is where it’s believed Chief Nicolai, likely persuaded, pointed to the area that was later to become the Nicolai Prospect and the Mother Lode Mine. From 1900 to 1902 Stephen Birch, a young mining engineer, bought the Bonanza claims and in 1905 formed the Alaska Syndicate. The Syndicate parties included the Guggenheim brothers and J.P Morgan who helped finance the venture. 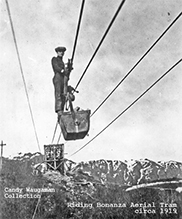 It was reorganized as the Kennicott Mines Company in 1908. Later in 1915 the enterprise emerged as the Kennecott Copper Corporation with Birch as president. 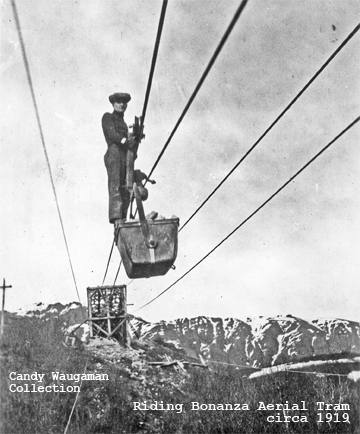 Needing a transportation system to get the copper to tidewater, construction began in 1905 on the Copper River and Northwestern Railway. Stretching 196 miles (316 km) from Cordova, the monumental feat would entail laying rail through nearly impassable terrain to the mine site at Kennecott. Lumber, equipment, and workers would be railed to Kennecott and the ore to Cordova, then by steamship to Seattle. Completed in 1911, Cordova became a busy port whose docks were piled high with bags of copper. Kennecott, population about 500, operated around the clock during World War I when copper prices were high. By the 1920s the high grade ore (85% copper) was being depleted and mining slowed. Copper hit its lowest price at 5 cents a pound in 1931, which prompted the mine to close. 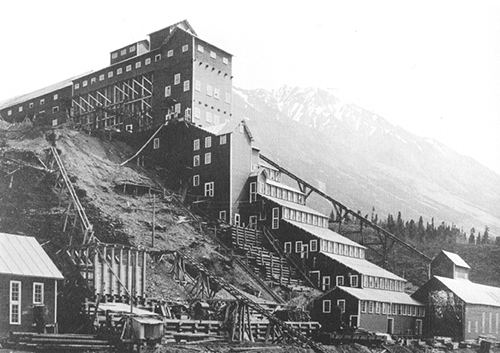 Kennecott was abandoned in 1938 after earning more than $100 million in profits from nearly 600,000 tons of copper. With short notice, the last train departed from Kennecott on November 10, 1938. Kennecott became a ghost town. In 1986 Congress recognized Kennecott Mines as a National Historic Landmark and efforts began to stabilize and preserve the site. The National Park Service acquired the Kennecott Mines National Historic Landmark in 1998. 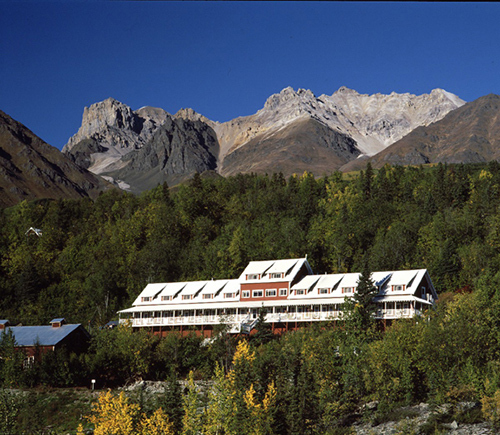 Kennicott Glacier Lodge, designed after the historic mining structures, offers visitor services at the Kennecott Copper Mine site. While Kennecott was strictly a company town, McCarthy grew into a small community serving the railroad and Kennecott. Established on John Barrett’s homestead, McCarthy developed from a small community in 1908 to a town in 1912. By the 1920s the population had grown to a couple hundred offering Kennecott workers and miners the free-spirited amenities such as bars, brothels and of course mercantiles. McCarthy flourished as a hub for outfitting prospectors coming into the country in search of copper and gold to the Nizina, Bremner and Chisana (Shushanna) Mining Districts. However, production at Kennecott and copper prices dropped in the latter 1920s and by 1931, the McCarthy school was closed down having only 2 pupils. When the Kennecott Mine closed in 1938, the population of McCarthy declined. 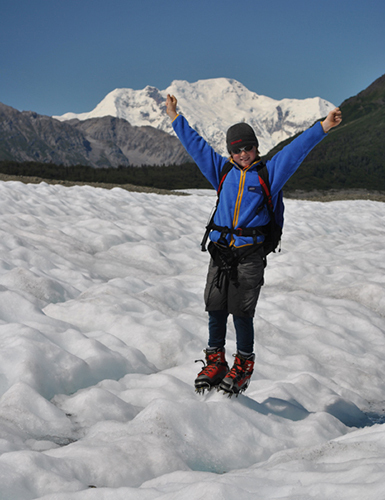 Now, with the establishment of Wrangell-St. Elias National Park in 1980, McCarthy and Kennicott attracts adventurous visitors and residents seeking a unique lifestyle and outstanding wilderness recreation opportunities. 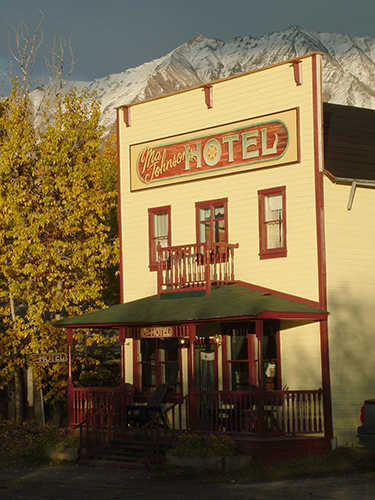 The historic McCarthy Lodge and Ma Johnson’s Hotel provide visitor services along with other local businesses (see above). "I can see what all the excitement is about. This adventure is going to add so much to our guests' experience in the Park. Thanks and a great job!." Copyright ©2019 Alaska Boreal Canopy Adventures. All Rights Reserved.